Rana Overseas leading manufacturer, exporter and supplier of Wooden Bangle Boxes, Wooden Bangle Stand. Our Wooden Bangle Boxes, Wooden Bangle Stand designed by artist beautifully showcase the traditional as well as modern designs. Wooden Bangle Stand shapes are extremely eye-catching with their compelling beauty. Our Wooden Bangle Stand have gained immense popularity worldwide. 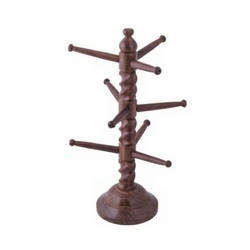 Supported by knowledgeable vendors, we are providing a wide series of Wooden Bangle Stand. We provide this product in varied forms that meet on customers demand. 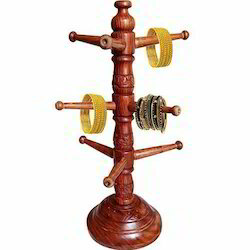 Wooden Handicraft Bangle Stand Antique Bangle Stand With 6 Rod.This is easy to carry folding bangle stand. Material: Wood Color: Brown Bangle Stand Height: 12 inches , Length: 11.5 inches , Width: 4.3 inches.Best gift for any occasion. Decorative and functional. Being a leading firm in this industry, we are offering a high quality range of Wooden Antique Bangle Stand. Among our wide range of products, we are offering a wide range of Wooden Trendy Bangle Stand. Our clients can avail from us the array of bangle stands, which are procured from the reliable vendors of the market. It is available in different designs, capacities, shapes, sizes and color. These stands are used for keeping the bangles in an organized manner and also used for displaying. Our clients can avail from us the array of bangle stands, which are procured from the reliable vendors of the market. It is available in different designs, capacities, shapes, sizes and color. These Bangles Stands are used for keeping the bangles in an organized manner and also used for displaying. We are looking for query mainly from Chennai, Tamil Nadu.